Adrenaline Rushes: Can They Help Us Deal with a Real Crisis? Harness the power of adrenaline. It can help you cope. The hostage taker walked to the door, holding his gun to his landlord's head with his other gun pointed at this wife. The police negotiator had assured him that food had been placed outside the door. As he opened the door, the SWAT team grabbed the landlord and pulled him outside as the hostage-taker slammed the door. He took one last look at his wife, put the gun to her head, and pulled the trigger. Then he killed himself. On the phone, the negotiator heard what sounded like two shots and hoped that the sounds were not what he thought they were. SWAT notified the command center that two people were dead. The negotiator put his head in his hands and began to cry. Thank God, this was a training simulation and not a real crisis; however, the stress and emotions felt by the police were very real. No one was really killed, and the SWAT team and the police commander learned a lot that day by examining the mistakes they made under intense pressure. As a crisis management consultant, I design and place people into highly realistic simulated situations where they experience the rush of adrenaline, anger, fear, frustration and hopefully... success in critical situations. I've had many federal law enforcement officers say, "Remember that simulation we did last year? I had a situation exactly like that and I knew exactly how to handle it." This type of training is called "state dependent." Studies have shown that recall appears to be better if someone is put into the state for which the initial memory was encoded. Participants are practicing skills in an "adrenaline rush" situation so that they can recall and activate the same skills in a real situation where the adrenaline is just as high or higher. Most of us will never have to live or work in environments as emotionally and physically intense as law enforcement or military personnel, where sharply honed cognitive and motor skills make the difference between living and dying. However, all of us will face crises and stressful life situations where we have to make important decisions that could impact our lives forever. Sometimes those decisions will need to be instantaneous. Can we train ourselves to handle "adrenaline rush" situations and be resilient to life's inevitable emergencies and setbacks? Maybe we can learn from the Army Special Forces. Dr. Charles A. Morgan of Yale Medical School, researched soldiers in a mock prisoner-of-war camp as part of their survival school. Everything was extremely realistic, including the grueling hours of mock interrogations designed to train soldiers to survive the real thing. Morgan took measures of a chemical in soldiers' brains called neuropeptide Y (NPY), an amino acid that helps regulate blood pressure, appetite, learning, and memory. It also works as a natural tranquilizer, controlling anxiety and breaking down the effects of stress hormones like adrenaline. NPY helps the brain regulate alarm and fear responses by keeping the prefrontal cortex of the brain working longer under stress. 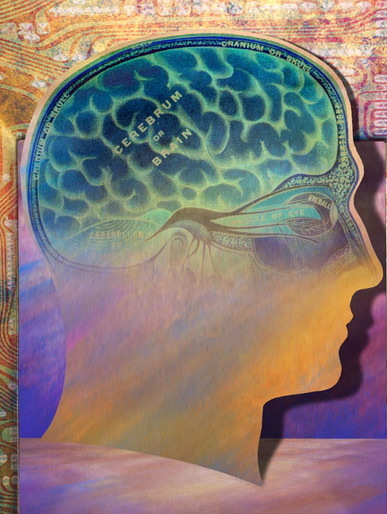 This part of the brain is responsible for higher-level cognitive functions like decision-making. Morgan found that Special Forces troops during the survival training, produce significantly greater levels of NPY compared with regular troops. In addition, the Special Forces soldiers returned to their original levels of NPY within 24 hours, while regular soldiers were significantly below normal. Because of the high amounts of NPY in their systems, the Special Forces soldiers were much more clearheaded under interrogation stress and performed better according to the trainers. Staying focused and engaged in a crisis and bouncing back faster afterward is a tremendous advantage in war and in everyday life. Dr. Morgan told me that he has replicated his findings in other domestic and foreign special operations personnel since his original study. At this point the evidence indicates that "innate differences in NPY (and some psychological factors) pre-date the selection gates and that other aspects are due to the "weeding out' effect of selection programs." He has not found evidence that training is producing the differences, but the understanding about this is limited by the fact that soldiers are not assessed at day one when they enter the service. Dr. Morgan and other researchers are hoping that NPY or drugs that act at specific NPY receptors might offer relief for symptoms of PTSD. According to Dr. Morgan, "There are experimental protocols that are approved, but not yet active, that involve intra-nasal administration of NPY." Perhaps future research will also provide information about how to increase our own NPY levels to better manage stress. Dr. Matthew Friedman, Executive Director of the Center for PTSD, is hoping that some day scientists will be able to train people to naturally raise their own levels of NPY to ward off the effects of stress. Putting yourself in structured, heart-pounding situations where you can practice cognitive and motor skills can be helpful. Michael Gass, Chair of the Kinesiology Department at the University of New Hampshire, has been studying the benefits of physical risk taking for over 20 years. He says that in the face of danger, instinct takes over. Your attention becomes keenly focused on your body and your surroundings. Details fall by the wayside, and you're forced to exist in the present and that you are provided with immediate, tangible feedback about how you're doing in the world around you. He believes this type of experience increases confidence and the learning transfers to other life situations. 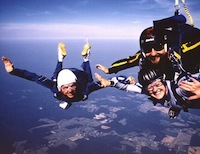 For most of my life, I have been a skydiver. I also surf, snowboard, pilot a hot air balloon, and do flying trapeze. So, yeah, I'm adrenaline junkie. But I've discovered that those activities are more than just crazy fun hobbies. I know those activities help me in everyday stressful situations where I need to keep a clear head. I know that learning how to fly through the sky in freefall and keeping my cool when my parachute fails to open, not only saves my life, but that skill transfers over to other high intensity situations where I need to make a quick decision under stress. It can be extremely beneficial to experience the full range of physical and emotional states - from the most intense adrenaline rushes to the depths of relaxation and be able to access and manage both as needed. These types of structured adrenaline experiences help create "situational awareness." Situational awareness involves being aware of what is happening around you to understand how information, events, and your own actions will impact your goals and objectives, both now and in the near future. Situational awareness is especially important in situations where the information flow can be quite high and poor decisions may lead to serious consequences. Little is understood about the underlying mechanisms of situational awareness, or about how individuals develop or maintain this complex cognitive skill. With a big hit of adrenaline, we tend to lose situational awareness. Our brains perceive danger and prepare us for "fight or flight." We lose our peripheral vision and focus on what is right in front of us. Our brain works to filter out any sound extraneous to the direct threat (auditory exclusion). We hyperventilate or hold our breaths. In some instances, this is exactly what we need to get out of harm's way, but in many intense situations, we need to be able to think clearly, hear what people around us are saying, breathe deeply to send oxygen to our brains, and act effectively to be able to survive the situation or master the skill we are learning. This is situational awareness. This too is probably a skill we can learn that can help us through stressful times and emergencies. "A single adrenaline burst that comes and goes very quickly is a good thing because it gives you energy and gets you ready to mobilize for immediate action," says Esther M. Sternberg, M.D., Director of the Integrative Neural Immune Program at the National Institute of Mental Health. Adrenaline created by an abrupt blast of stress sends a flood of oxygen-rich red blood cells through your body, boosts your immune system, and signals your brain to start releasing painkilling dopamine and endorphins. You may not be the kind of person who wants to jump out of airplanes or bungee jump, but there are many ways to train your brain and body for intense life situations, perhaps even increasing NPY levels and situational awareness. Future research will tell us. Finding adrenaline rush experiences does not mean acting foolishly or carelessly. Here's an approach you might try. Identify some activities that make you feel slightly uncomfortable but still interest and excite you. Make a list of the activities that would challenge you, for example, making a speech, learning to swing dance, learning a foreign language, traveling abroad, learning to play guitar, riding a roller coaster, climbing a mountain, hiking the Appalachian Trail, or bungee jumping. Imagine yourself doing each activity. See what you would see, hear what you would hear, and feel what you would feel. Next, give each activity a perceived adrenaline rush number, with 1 being relaxed, and 10 being extremely intense. Select an activity(s) that you want to actually experience. Choose something that would be fun to try, and work up to what might be most challenging for you. Don't choose something that will overwhelm you. Calm yourself down afterward. Pay attention to breathing and heart rate. Process your experience by talking with others. Do it again. Have more fun and less anxiety. Many people discover that the more they are able to successfully accomplish adrenaline rush activities, the easier it is to think clearly, react effectively, listen, and breathe during other intense experiences. 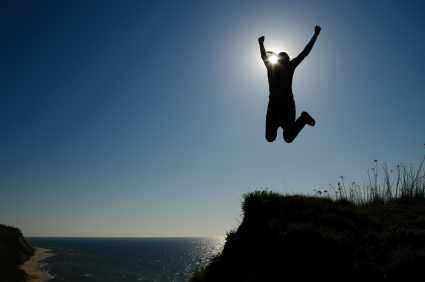 Have you found that adrenaline rush learning experiences helped you to cope with everyday life? Please share your experience. What you can do to stay safe and help prevent these horrors. Hero or Victim: How do You Deal With a Crisis?